When someone mentions St. Patrick’s Day, the first thought isn’t usually fundraising. However, the St. Patrick’s Day Pub Crawl sought to combine drinking and supporting a good cause. The $10 buy-in fee from pub crawl held on March 14 was donated to Dakotathon. Over 50 people participated, and $600 was raised. Michaela Goldammer, a senior strategic communications major and Marketing Chair for Dakotathon, said that although the proceeds will benefit the Children’s Miracle Network, the pub crawl is not affiliated with Dakotaton. 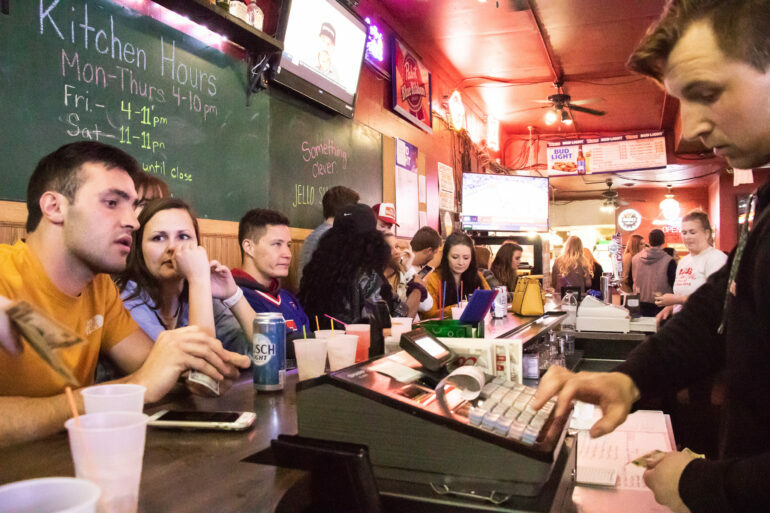 The pub crawl featured spots at different restaurants and bars in Vermillion, including Old Lumber Company, Leo’s and The Varsity. Each of the participating bars offered discounts to those participating. Diane Wirth, owner of The Varsity, said she is pleased to offer discounts for fundraisers. Jacob Meyer and Quincy Score, the Events and Fundraising Chairmen for Dakotathon, organized the event. The idea for the St. Patrick’s Day Pub Crawl began in 2016, and has continued on as a tradition. Meyer said it is easy to get both the students and bar owners involved. “If there’s one thing I’ve seen everyone on campus agree upon, it’s that we all love having a great time,” he said. Goldammer said it’s easy to promote the pub crawl because of its social nature.